We have studied about a wide range of different tribes of people who have lived on the African continent since time began. We have noticed have diverse these people can be with different customs, traditions, languages, artwork, history, etc. For this project, you are to choose a tribe in Africa. Then, you choose if you would like to create a MASK or a NECKLACE that reflects on the tribe you chose. If you need another copy of the above hand-out, click above. _____ Use the Internet, encyclopedia, other reference materials available at your school library, local public library, or at home research African masks. Identify a mask you would like to recreate. Print out or copy the materials you find on the Internet or at the library and staple that research to this paper. You need the sketch the mask itself and copy down the information needed on your “Museum Card” – see below. 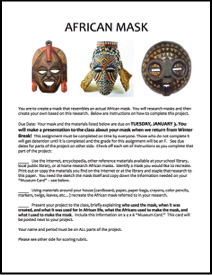 _____ Using materials around your house (cardboard, paper, paper bags, crayons, color pencils, markers, twigs, leaves, etc…) recreate the African mask referred to in your research. 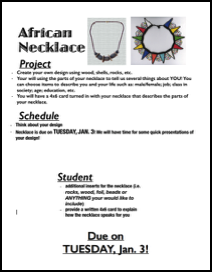 _____ Present your project to the class, briefly explaining who used the mask, when it was created, and what it was used for in African life, what the Africans used to make the mask, and what I used to make the mask. Include this information on a 4 x 6 “Museum Card.” This card will be posted next to your project. Click on the links below to take you to the websites that are on your handout to choose a tribe and the mask you would like to create.